VATICAN CITY (CNS) — In making economic policies and decisions, solidarity is too often treated as “a dirty word,” yet the only way out of the global financial crisis is to put people — with their dignity and creativity — first, Pope Francis said. Meeting March 20 with about 1,700 officials, employees, retirees and laid-off workers from a large steelworks in Terni, Italy, Pope Francis said each person will have to make some sacrifices in order to help the entire community. 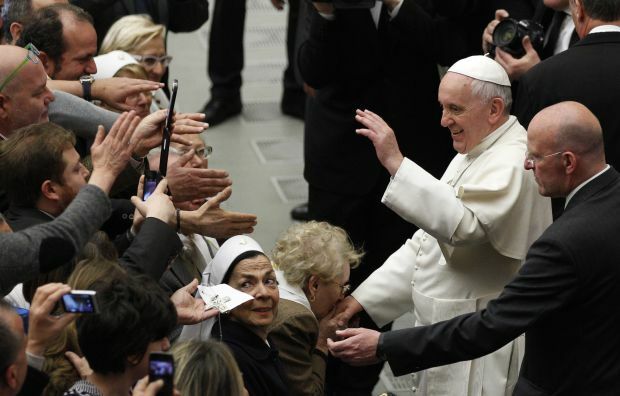 “If everyone does his part, if they all put the human person and human dignity — not money — at the center of their concern, if they can consolidate an attitude of solidarity and fraternal sharing inspired by the Gospel, then it will be possible to get out of the swamp of an economic and employment situation that has been hard and difficult,” the pope said. The workers from the Terni plant were joined by more than 5,000 family members and pilgrims from the Diocese of Terni, Amelia and Narni, including those who work with Catholic charities to distribute food, clothing and other necessities to the unemployed and their children. The solution, he said, must be creative and courageous choices by business owners, entrepreneurs and artisans combined with solidarity and generosity on the part of the entire society.